Microsoft is rolling out new features to the mobile version of OneDrive. The company has also announced that it is introducing a new Block Download feature in "late November" that can be used to stop people from making copies of a file or its contents. 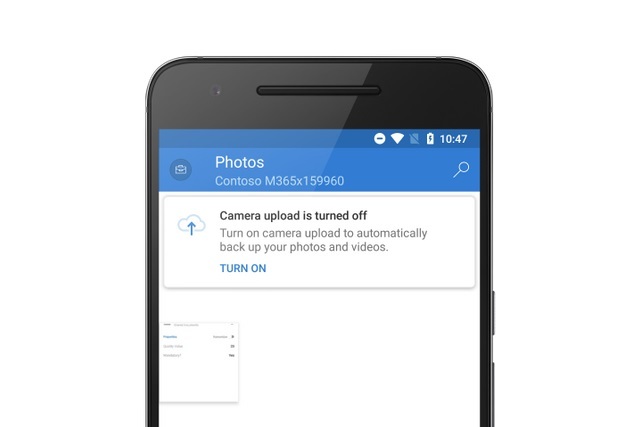 Android and iOS users can look forward to improvement to the MyAnalytics component, but the big OneDrive news is that the Camera Upload feature has now left beta and is available to everyone -- if they are using Android, that is. The changes to MyAnalytics mean that there are now "new entry points to the view count and context menus for individual files", which Microsoft says will "make it easier to see everything that's happening around your files". The impending roll out of Block Download for Anyone and Organization sharing links is something that will please organizations looking to protect their files, but it is Camera Upload that's likely to generate the most interest. Once enabled, this feature will allow users to automatically upload all photos in the device Camera Roll to a selected OneDrive for Business account. To enable this feature, go to the "Me" view from within your OneDrive for Business account and tap "Photos". You will see a prompt like the one [above], tap "Turn On" and read the ensuing prompts carefully. Check for app updates to ensure you can take advantage of the new features.